And that is what I did. For TWO DAYS, starting on Saturday the 25th, I spent several hours in the field looking for the bird. 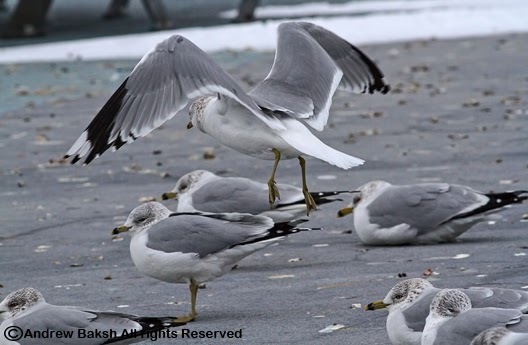 Starting at Veteran Memorial Pier in Brooklyn NY, where the Common Gull, was initially found by Shane Blodgett. Unfortunately, on Saturday I had to leave due to an emergency and about 15 minutes after I left, I got several phone calls and texts indicating that the bird had shown up. Many folks who knew that I had frozen my hands and feet off in the field patiently looking all day were bummed that I missed it. But I shrugged it off, I had to leave there was no other way around my departure and left it to faith and luck in hoping I had another crack at it the next day. So some readers might be wondering. What's that? 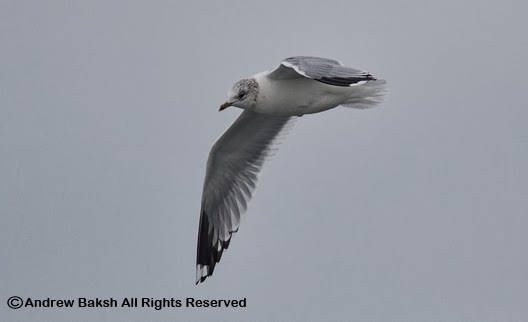 A Common Gull? Shouldn't there be a lot of them around then with a name like 'Common"? Well, this beauty, may be common elsewhere; however, it is quite a rarity along the Atlantic Coast. Also known as Mew Gull, it is common along Pacific Coast beaches in winter. 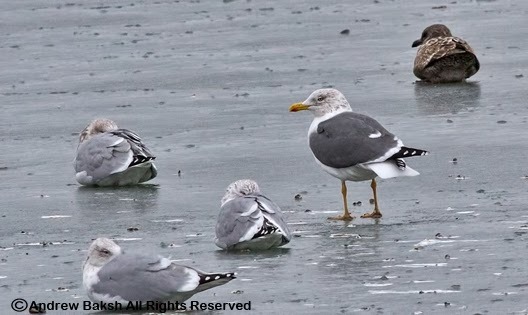 In Eurasia, where it occurs, it is known as the "Common Gull." 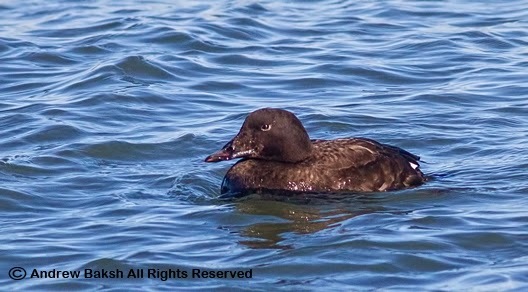 Birds showing up on the Atlantic Coast are said to likely be from Europe. So now you understand the fuss. The next day (Sunday), I decided to start the day by trying for a Barnacle Goose that was found on Saturday by Anya Auerbach at Randall's Island Manhattan NY. I found it where it was last reported and shared views with a birder named Alexis. I then waited for over an hour for my friends Tom Burke and Gail Benson who came to see it. By then, I had gotten cold again to the point of shivering. The wind that whips through Randall's Island, is no joke. After getting splendid looks at the Barnacle Goose, I decided to make my way back to Brooklyn to try again for the Common Gull. A quick stop at Baisley Pond in Queens to look for Geese and then it was onto Veteran's Memorial Park, to once again brave the wind and cold (crazy stuff birders do). As luck would have it, I was stunned that in a matter of minutes after arriving I managed to lock onto the prize! Talk about the Gods taking pity on me. I enjoyed excellent views with Jim Merwin who incidentally reminded me that the last time we met was at the East Pond at Jamaica Bay where we had a lengthy discussion on the nuances of identifying Long-billed Dowitchers. That day we had crippling views of an immature LBDO. Jim and I were very lucky to pick up this bird in flight and then tracked it once it landed. Not wanting to take our eyes off or walk away from the bird, we waited until a couple of birders who were at the base of the pier looked our way and then waved them over. I believe the birders were Sam Stuart and Rhys Marsh. Only one other birder, Karen who had seen the bird the day before made it in time to see the Common Gull with us before it took off heading towards the Verazanno Bridge. We had tried during the short time we had the bird, to wave off people jogging and or strolling along the pier but we were not successful with all of them and the bird was noticeably nervous after one fellow stopped behind the roosting flock to take photos of who knows what. Here are some photos, I hope you enjoy them. This is the view in flight that Jim and I got of the Common Gull flying into the Pier. Note the extended mirror (white) on P10 (primary flight feather counting from the outer feather inward on the wing), quite unlike what one would see in a Ring-billed Gull. Another nice view of P10 as well as the extended white on the secondaries as the bird got set to land. 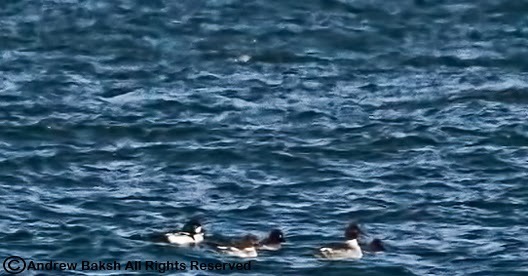 On this bird P8 is mostly black but in some birds it could show a mirror. Howell and Dunn has a nice example of this in Gulls of the Americas image 22B.8. Here is a nice tight crop of the bird resting. Note the nice Tertial Crescent, created by the extended white on the inner secondaries. 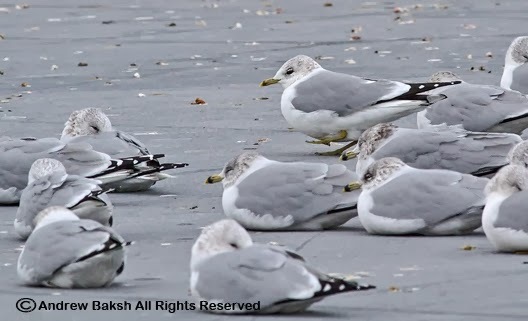 It stands out in comparison to the Ring-billed Gulls. 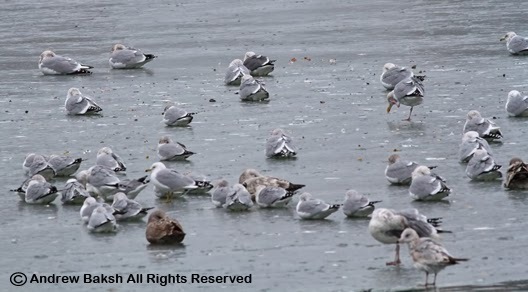 Note also the dark eye in comparison to the eyes of nearby Ring-billed Gulls. Here is a shot before it settled in to rest. 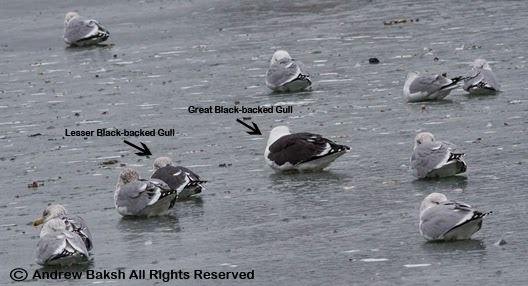 Note the smaller bill and the dusky type subterminal ring on the bill in comparison to the nearby Ring-billed Gulls. The head is also more rounded, giving a gentler look than what one would see in a Ring-billed Gull. I am not sure if readers would notice this and it could be the lighting at the time of observation. I should note that the bird seemed to show a subtly darker shade of gray on the mantle. My curiosity got the better of me as I wondered about the low numbers of Canada Geese being reported from Van Cortlandt Park in the Bronx. 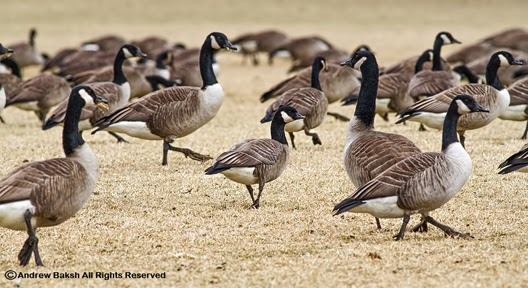 Having birded the Parade Grounds at VCP (Van Cortlandt Park) extensively, I knew from experience that Geese numbers could get as high as in the thousands in the winter. So the reports of 50 Geese on the field had me puzzled and I wondered what was happening on the field. Was there some change to the field that the birds did not like? Or were these birds being under reported. With the pending snow to arrive on Tuesday, I decided to go Geese studying on Monday and I am glad that I did. There were certainly more than 50 Geese on the Parade Ground Fields and I estimated the number to be about 2300. Maybe they all just showed up after the reports of paltry numbers?? (I doubt that). With a sizable flock to study, I was hoping that I would find something odd like perhaps a Cackling Goose. Cackling Goose Center. Note the smaller size with small bill. Some of you may say to yourselves. What is a Cackling Goose? Well, Cackling used to be all lumped in with Canada Goose until there was a split in what I believe was the 45th Supplement to the AOU (American Ornithological Union) Checklist. 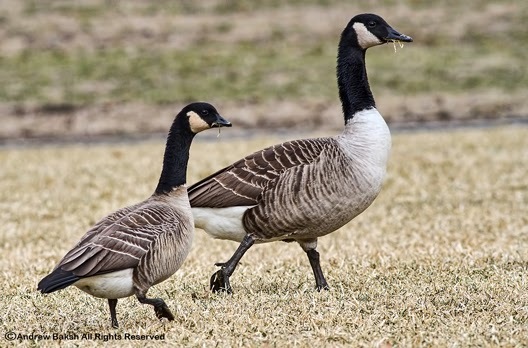 In other words, the Canada Goose race was divided to differentiate the large bodied interior and southern breeding species (Canada and its subspecies), from the small bodied tundra breeding subspecies (Cackling and its subspecies). 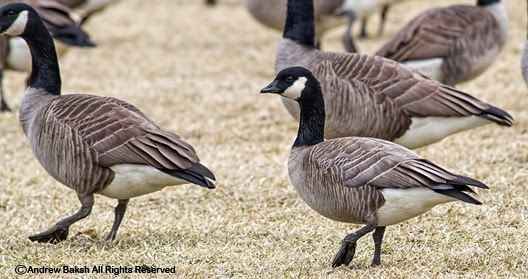 The Cackling Goose is made up of 4 subspecies that mainly breeds in the tundra. B. h. hutchinsii – Richardson’s (or Hutchins’s), B. h. taverneri – Taverner’s (Alaska) Cackling Goose, B. h. minima – Cackling Cackling Goose and B. h. leucopareia – Aleutian Cackling Goose – includes asiatica which is considered extinct. Cackling Goose (Right) Cropped to give viewers a closer look at size in structure. The expected vagrant Cackling here in the NE is the Richardson form of Cackling but I have been looking very carefully to see if any of the other subspecies type might show up. In this flock, I found 2 definite Richardson form of Cackling Goose and a possible third. The third bird, I did not get sufficient time to study it well or to get photos as it was flushed with some Canada Geese off the fields by an unleashed dog, which seems to be a regular thing that occurs on the fields despite the posted signs to keep dogs leashed. I have posted some photos for your viewing pleasure, which I hope helps in differentiating Cackling from Canada. Cackling Goose (left) smaller than the larger Canada Goose. My regular readers know how much I love shorebirds and so it is with delight that I share with you a recent article that discusses one of the world's greatest migration. 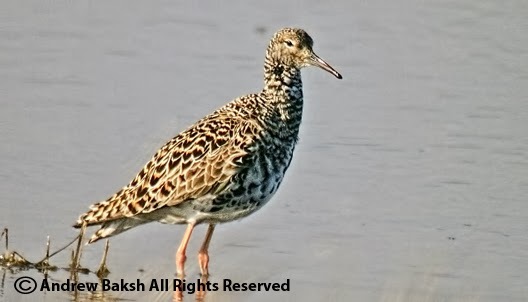 And as you guessed by now, it has to do with a shorebird. 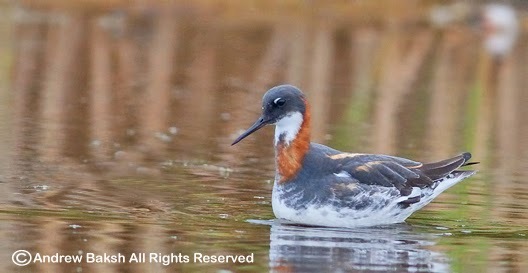 A Red-necked Phalarope fitted with a tracking device weighing less than a paper clip provided scientists with an astounding discovery about its migration pattern. A few hours at Kissena Park turned up some good birds. Most notable were Gray Catbird, Rusty Blackbird (flock of over 100), Brown Thrasher (4) and a very cooperative Hermit Thrush. 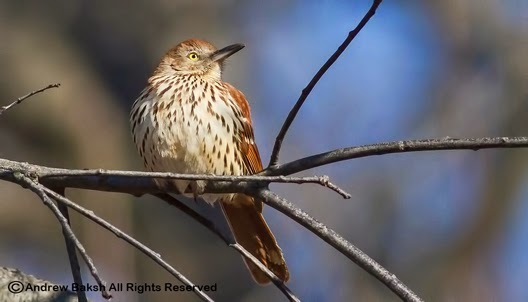 Both the Rusty Blackbirds and Brown Thrasher were flagged as high counts in eBird and understandably so since it not a usual occurrence to have this many around. Here are some photos. 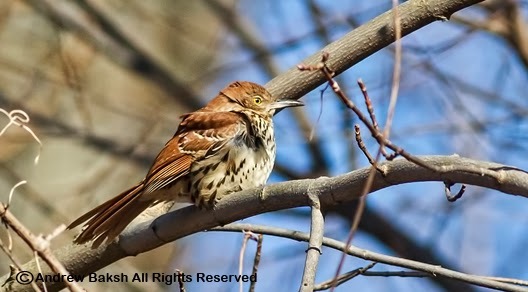 1 of the 4 Brown Thrashers seen at Kissena Proper. 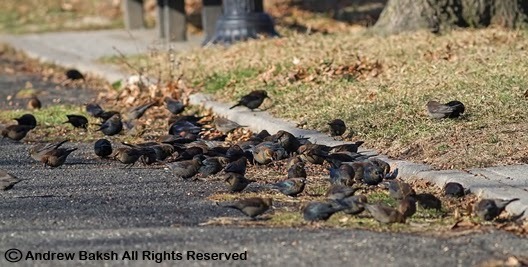 Small subset of the more than 100 Rusty Blackbirds counted. 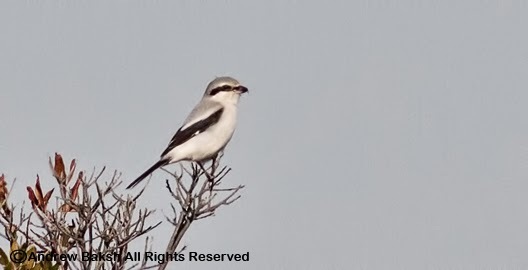 The new year's day birding out on Long Island New York got off to an excellent start with a most cooperative Northern Shrike that posed for a photo at the Jones Beach West End II parking lot. 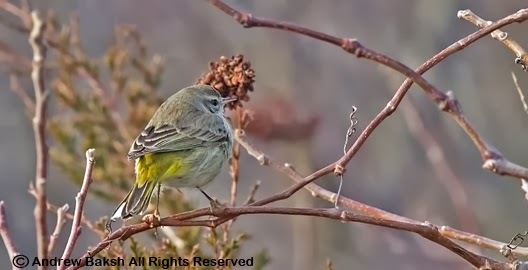 This was a bird that was seen in the same area sporadically in 2013 but was badly missed on the Southern Nassau CBC (Christmas Bird Count) which was a few days ago. My friend Doug Futuyma and Bob Proniewych showed up at West End II and we teamed up to do a bit of birding. We did pretty well, adding a number of goodies including Gyrfalcon, seen at Cedar Beach Marina (another CBC miss) and Barrow's Goldeneye (drake), seen at Sands Point. A surprising Palm Warbler (western subspecies) was a very, very nice surprise and I managed a photo for documentation purposes. Doug, Bob and I rushed back to Jones Beach to follow up on a report of a Pacific Loon near the Coast Guard Station but the bird had drifted on by the time we got there. Teaming up with another friend, Dave Klauber, we four checked a few areas at Jones Beach and Point Lookout. We had an interesting loon that looked good for Pacific but in the end after much discussion, we let it go as none of us were willing to confidently take it based on the looks we had. In retrospect, a few of us felt we over thought the bird but such is the case of conservative birding and I am okay with letting a bird go, if I am not 100 % convinced. I was blessed with the good fortune of being able to see lots of excellent birds for 2013 and not all of them were rarities. If I could, I would have liked to have spent more time on Gulls studies. Perhaps this year. Happy New Year to all my readers and may your future be filled with good fortune and lots of birds. A lot of excellent birds did not make my top ten, like the "very likely" Siberian form of Common Tern or some of the spectacular Arctic Terns, I had this year on Long Island. Nevertheless, I think you will like the list and if you don't then I promise to do better this year. Without further ado, here are my top 10 birds for the year 2013. 10. 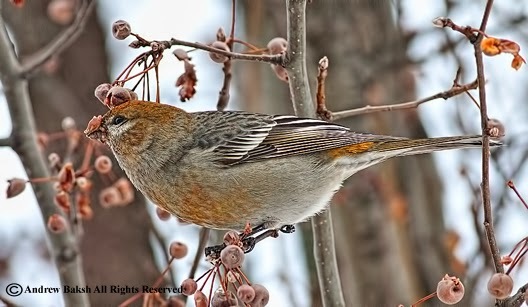 My Life Pine Grosbeak. The views were spectacular and I can't wait to see them again! 9. 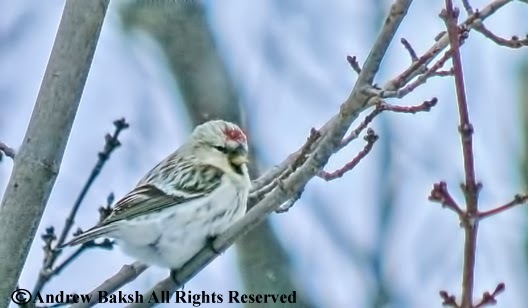 Only my second Hoary Redpoll ever; this time I managed a photo. Thank you Joan Collins! 8. My first Dunlin X White-rumped Sandpiper which ultimately led to the Elegant Tern find. 7. 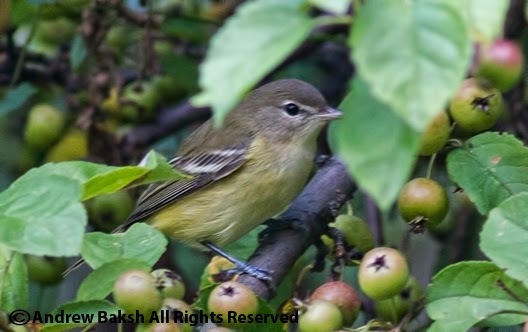 This Bell's Vireo was a very pleasing find at Kissena Park Queens. 6. 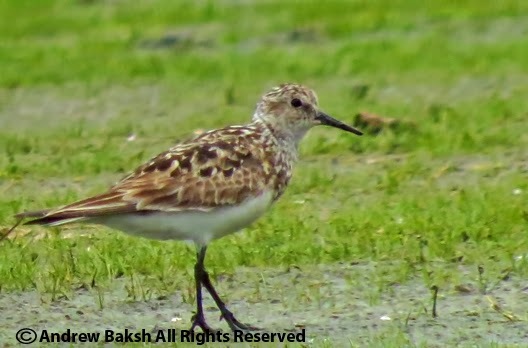 This RARE worn adult Baird's Sandpiper was a special find on the East Pond at JBWR! 5. 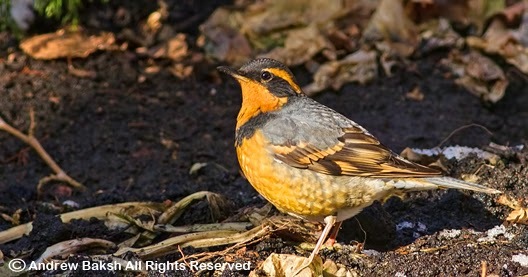 My best photo of a Varied Thrush - a great find by Louise Fraza and Pearl Broder. 4. 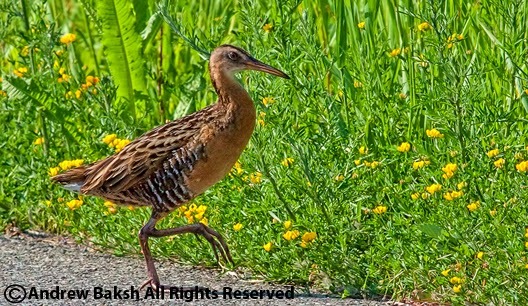 Crippling looks at my lifer King Rail with a photo to boot. 3. 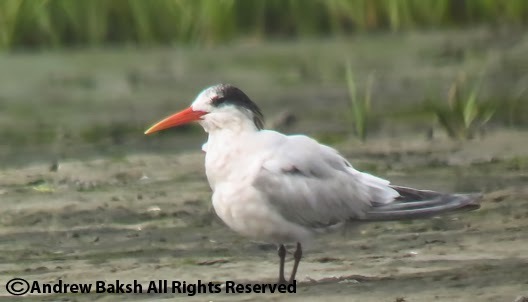 Elegant Tern, a 1st state record find by Andy Guthrie and I on the flats at Cupsogue LI. 2. One of two RUFFS from Timber Point LI - a lifer for Andria. 1. 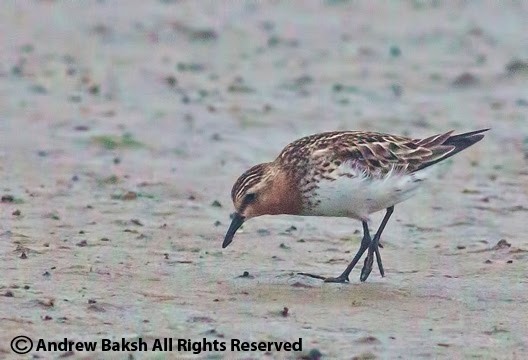 Red-necked Stint found with John Gluth at Cupsogue LI. Read all about the find here.